I have so many clients recently that have needed designs done for them that have had carpeted spaces. Nothing wrong with that, I myself only have carpet (dreaming of wood). The decision then becomes do you want to put a rug over your carpet or do you want to leave it blank? I don’t mind designing either way. For those that don’t want to add another layer to their floor, they have an option that is being seen more and more: sheepskin rugs. Power houses like IKEA have made it very easy for clients to get a small pop of comfort on their already cozy carpet without breaking the bank. 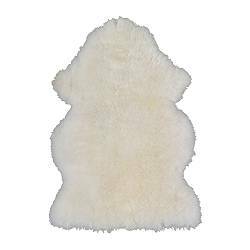 The Rens sheepskin rug is only $30. They also have the Tejn faux sheepskin for only $10. Adding a few of these rugs in designated spaces can really add a sweet look and just the right bit of extra comfort. One of my favorite inspirations is Ford’s nursery from the Me Oh My blog. I just love love love how the sheepskin rugs add another layer of texture to her already fabulous rug.